Learn how Bryant Brown’s healthcare marketing specialists provide pro bono support to the School of Visual Arts and Humanities in LA. For several years now, Bryant Brown Healthcare has been providing pro bono support to the School of Visual Arts and Humanities. “SVAH” in Koreatown in Los Angeles is a college prep high school with a curriculum centered around the arts. 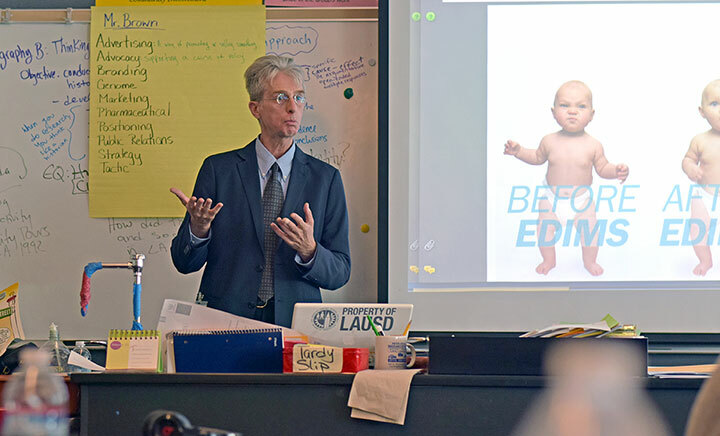 One of our partners, Bob Brown, joins classes several times each year to talk with students about full-time and freelance career opportunities in advertising and PR. Discussions focus on how the work in an advertising and PR agency combines the curriculum from each of the students’ core areas of study: Math, Science, History, English, and Art. We also participate in the job interview program, where professionals like us conduct mock interviews of high school juniors and seniors. It’s heartening to see a line of students, dressed to impress, each with a resume in hand, ready to discuss why they are so eager and qualified to enter the workforce. Hopefully, the students derive benefits from our participation. Undoubtedly, we do. Stepping on campus (located on the 24-acre Ambassador Hotel complex, the site of Robert F. Kennedy’s primary election victory speech and assassination in1968) is energizing. It’s inspiring to work with students eager to enter the work force and succeed. The faculty and staff are amazing, working hard, with the students’ best interests always their top priority, and often scrambling for resources. And we thrive on our connection to the arts – design and creative writing are fundamental to our daily work. Just as the SVAH students and faculty do, we feel a tinge of sadness as another school year ends. We’ll enjoy the short break but look forward to our return.